Providing consistent flow and loading to a biological process is important to maintain optimal treatment. Equalization (EQ) Basins are designed to provide consistent influent flow to downstream processes by retaining high flow fluctuations. Due to the additional retention time, aeration and mixing is required in equalization basins to prevent the raw wastewater from becoming septic and to maintain solids in suspension. Aeration Industries’ Aire-O2 Triton® aerator and mixer coupled with a guide rail assembly or swing arm, provides a maintenance friendly alternative to diffused aeration systems. Aeration Industries can include a custom control panel equipped with discreet or analog level indication for operator reference as well. 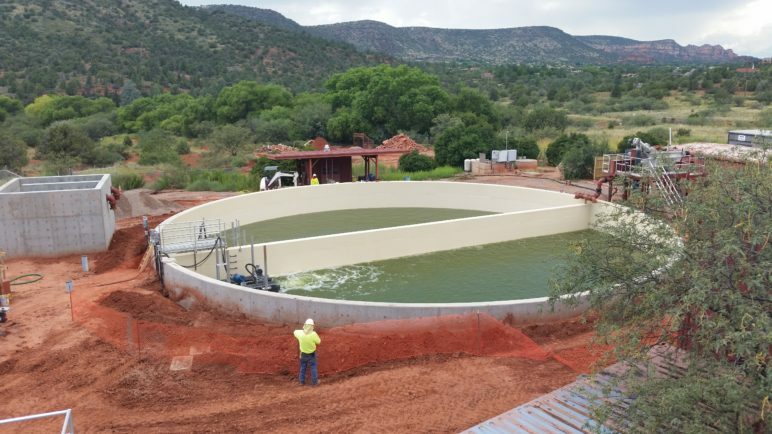 We offer equipment that mixes your EQ Basin to keep suspended solids in solution, add fine bubble aeration to minimize odors, and also ensure predictable and constant flow equalization. Read more about equalization basins.